This past winter was unusually warm, which we really enjoyed in the barn. And now the warm weather is here, the days are noticeably longer, the horses are shedding… and we are getting ready to ride outside, hit the trails, and go to some shows! It’s looking like this year we will have a few riders doing schooling shows as well as a few riders doing Recognized shows, and some doing both. 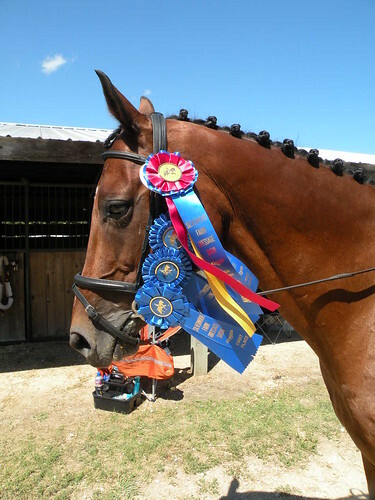 Everyone is setting goals, including getting the scores to qualify for the IDCTA schooling show championship, USDF rider performance awards, and a few ambitious riders even want to make it to Regionals, which is at the Kentucky Horse Park this year! Sounds like a fun summer is ahead! So, now’s the time to prepare. Memberships need to be renewed and tests need to be memorized. By giving ourselves plenty of time to get ready, we make showing an enjoyable experience, and when we’re having fun, success is sure to follow! We do have a stall opening up next month, so if you’ve been thinking about joining us, now’s the perfect time! Our group is a friendly mix of kids and adults, and we’d love to have you and your horse on our team this year.